The Android distribution numbers were updated this afternoon for the month of April. The numbers indicate a pretty dramatic increase for Jelly Bean month over month and now show it as being on 25% of all Android devices (4.1.x and 4.2.x combined). Last month, Android 4.1+ share stood at just 16.5%, so this is quite the jump, which we’ll get to in a moment. The rest of the numbers are as follows: Ice Cream Sandwich (29.3%), Honeycomb (0.2%), Gingerbread (39.8%) Froyo (4.0%), Eclair (1.7%), and Donut (0.1%). 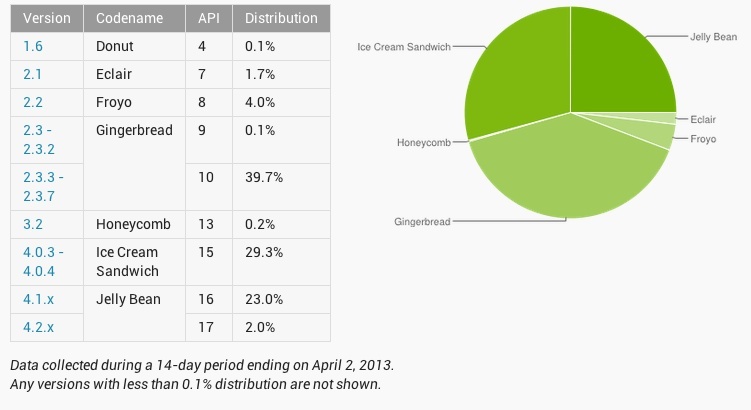 For those keeping track, that puts Android 4.0+ at 54.3%, with Gingerbread still leading the individual category at 39.8%. The Android Developers team announced through Google+ and on the distribution dashboard that the giant leap forward for Jelly Bean is likely do to an update in the way they calculate numbers. Rather than pulling numbers based upon devices that have checked into Google servers, they are using numbers based upon users who visit the Google Play store. Since these numbers are supposed to be used by developers, not just as stories for silly websites like ours, this move makes a lot of sense. Google is doing whatever it can to help developers target audiences for their apps, and that’s a good thing.